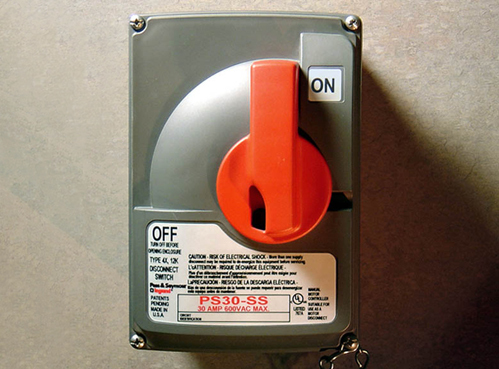 Pass & Seymour Safety Switch — Brownlie Design, Inc.
Safety and efficiency dictate that a power switch controlling machinery be highly visible and its function be readily understood. Brownlie Design gave the rotary switch a bold, easy-to-grab lever whose position clearly indicates on or off, with the direction of travel described by a sweeping arc sculpted into the cover. Slots integrated into the lever and box allow the switch to be padlocked in the off position. All features were designed to withstand the rigors of an industrial environment.